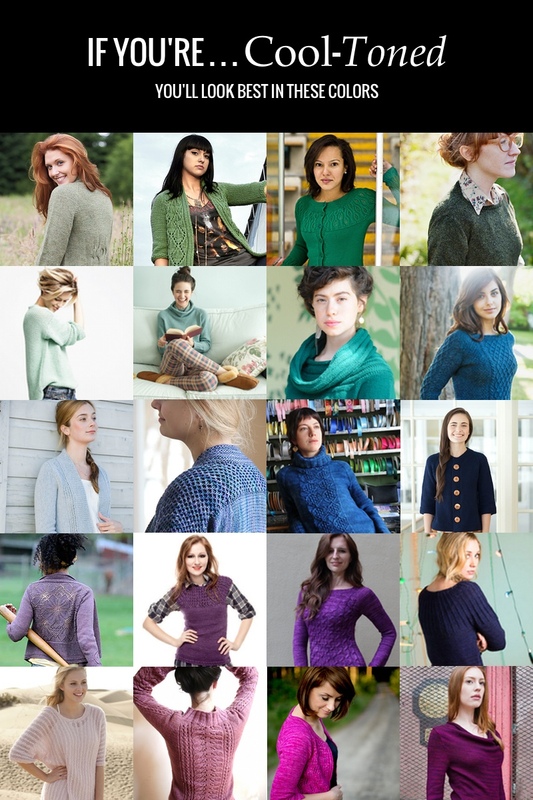 This series covers how knitters can use color theory to improve their sweater knitting. 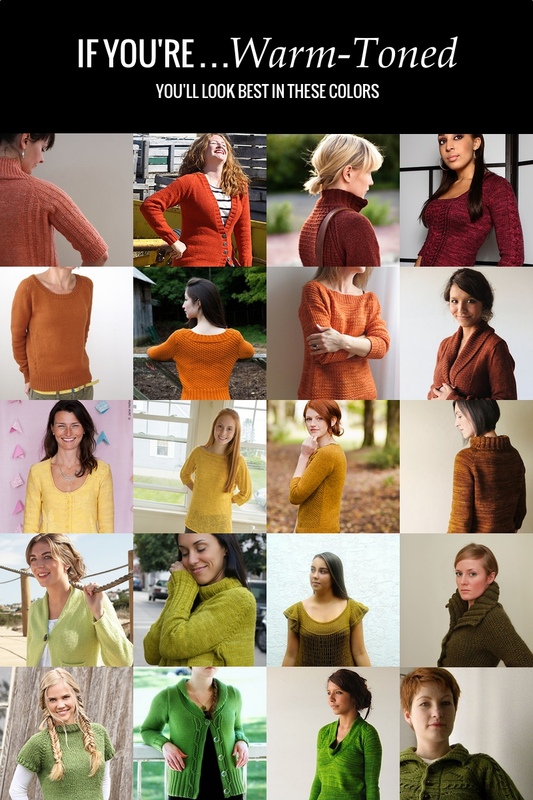 In Parts 1,2 and 3 of the Color Theory Series we talked about the color wheel and how to unlock its mystery in regard to sweater knitting. If you haven’t read them yet I highly recommend taking a minute to go check them out before continuing. 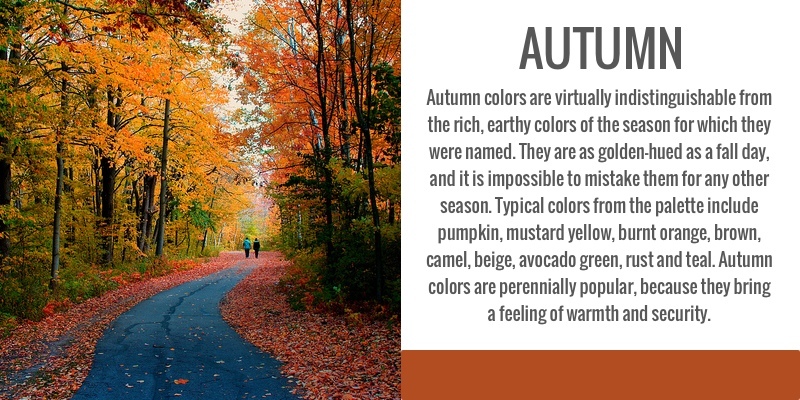 Today we’re going to jump into the crazy world of seasonal color analysis. Color analysis the process of finding colors of clothing to match your complexion, eye color, and hair color. It is often used by stylists in wardrobe planning and style consulting. It is important in this case because when you spend a lot of time and energy on knitting a garment it should look incredible on you! Choosing the best color for your skin tone is one way we can assure you’re always looking your best! Color analysis is the process of determining the colors that best suit your natural coloring. There are a wide variety of approaches to analyzing personal coloring. 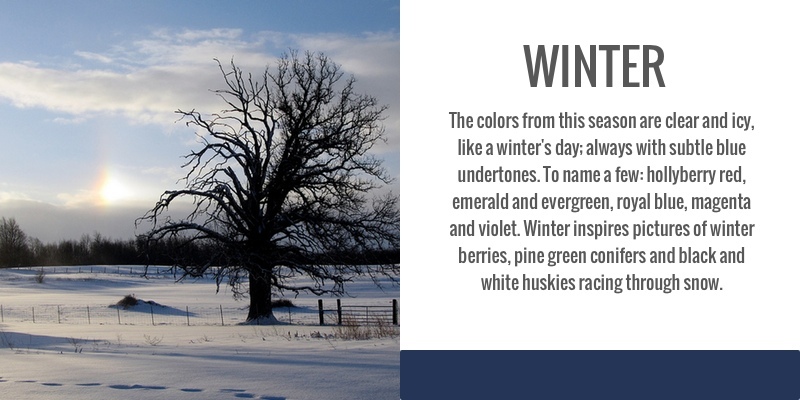 The most well-known is “seasonal” color analysis, which places individual coloring into four seasons: Winter, Spring, Summer and Autumn. Seasonal color analysis was made popular by Carole Jackson when she released her incredibly popular book “Color Me Beautiful” in 1980. In it she emphasizes the importance of figuring out what works for you and your life specifically, instead of following trends, and the idea of slowly building up a wardrobe around your individual style and color palette. The seasons have nothing to do with your favorite season or the season in which you are born. Instead they are a more poetic way to separate the different color types. 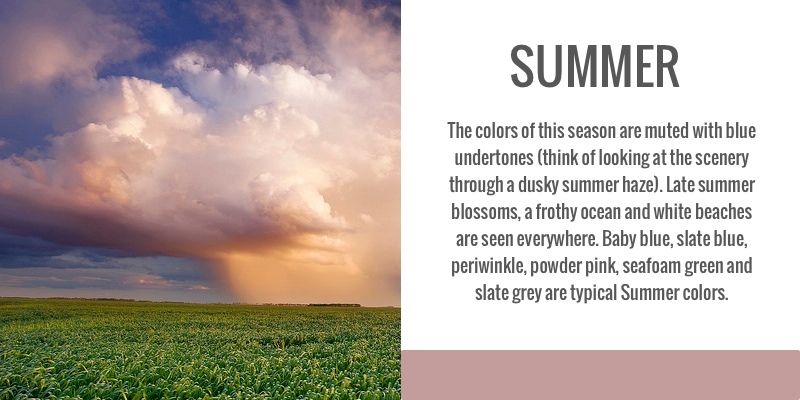 They could just as easily be called Types A, B, C and D. However if you use this basic outline of the colors in each season it is simple to remember. Sometime in the 1990’s “Color Me Beautiful” increased the number of types from 4 to 12 for increased accuracy. However, sometimes this can make it a little bit more difficult to pinpoint your type. We will be delving deeper into the additional 8 types and their corresponding color palettes in the next series “Color For Your Skin Tone”. Your skin’s undertone is the color underneath the surface. You can have the same skin color (ivory, tan, beige, etc) as someone, but a different undertone which might cause you to look completely different. If your hair and skin tone have warm undertones, you would be classified as either a Spring or an Autumn. If your skin has a blue-ish, cool undertone and your hair is more ashy with no golden or red highlights, you are either a Summer or a Winter. Let’s look at some ways can you determine which category you fall into in regard to undertones. Push your sleeves up right now and look at the veins on the inside of your wrist. Are they blueish or greenish? If they look more blue, you likely have cool undertones. If the veins look greenish, you’re warm. It’s worth noting, warm girls, that you’re veins aren’t actually green — they look that way because you’re seeing them through yellow-toned skin (If we’re mixing colors then yellow + blue = green). Think about whether you look better in silver or gold jewelry. Not which you like more, but which actually makes you look more radiant, glowing, and awake. Typically, women with cool undertones look better in silver and platinum metals, and warm-toned women look better in gold and rose gold. Think about what neutral shades are most flattering on you. Does your skin, eyes, and face look better in bright white and black hues? Or are ivory, off-whites, and brown/tan shades better on you? The former means you’re probably cool-toned, and the latter, warm. Your natural eye and hair colors can also help figure out your undertones. Usually, cool toned people have eyes that are blue, grey-blue, grey, cool green, grey brown or slate and have blonde, brown, or black hair with blue, silver, violet and ash undertones. Conversely, warm-toned women usually have clear blue, turquoise, green, hazel, light brown, olive or warm green eyes with blonde, strawberry blonde, red, brown, or black hair. Their hair tends to have gold, red, orange, or yellow undertones. When you’re out in the sun, does your skin turn a golden-brown, or does it burn and turn pink first? If you fit into the former category, you’re warm-toned, while cool tones tend to burn – fair-skinned cool girls will simply burn, while medium-skinned cool-toned girls will burn then tan. Using just your skin tones you can actually split the color wheel right down the center into warm and cool colors to find colors that will look good on you. This is wonderful to remember if you’re wanting a general idea of your best colors but can’t recall the specifics. If you have cool undertones the cool side of the color wheel will be a great option for you. If you have a warmer undertone then stick to the warmer colors on the color wheel. 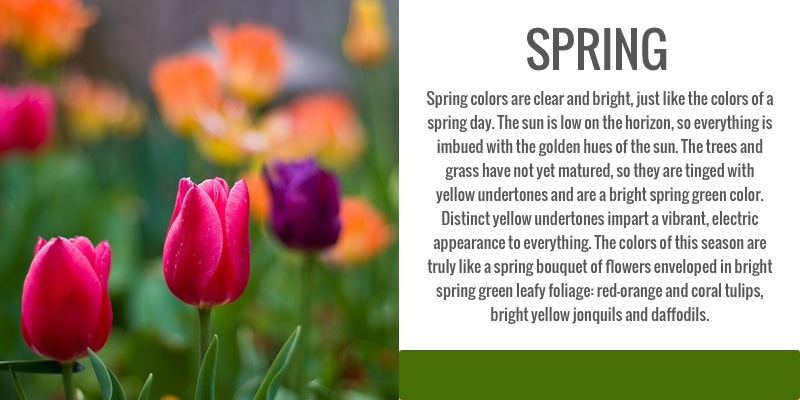 The second part of determining your season is how light or deep your coloring is. This part is actually pretty simple to find out and is based on your natural hair color. If your natural hair color is lighter than medium brown, you would be typed as either a Spring or a Summer. If your natural hair color is darker than medium brown you are a Winter or an Autumn. Now that you’ve figured out your skin’s undertone and how light/deep your coloring is you can determine your season! This is a very stripped-down summary of the whole process. The original Color Me Beautiful material provides a much more detailed explanation and also outlines various exceptions (for example, in very rare cases a Winter type can have almost platinum blond hair). 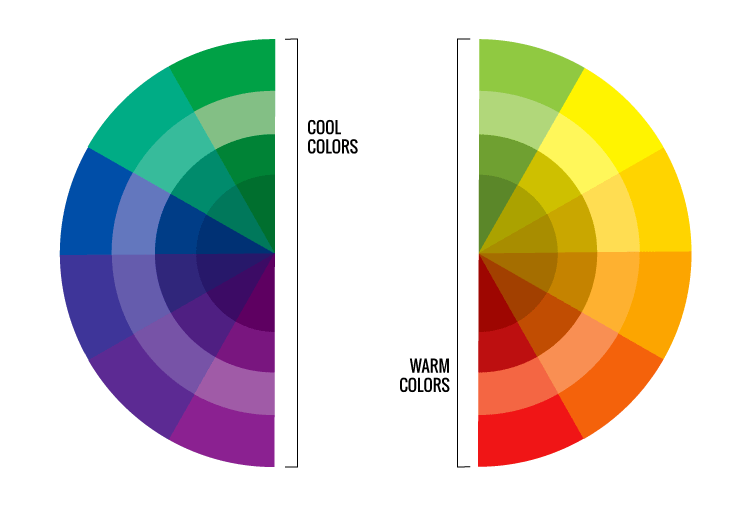 If you’d like to learn more, check out this great series on color analysis over at into-mind.com. 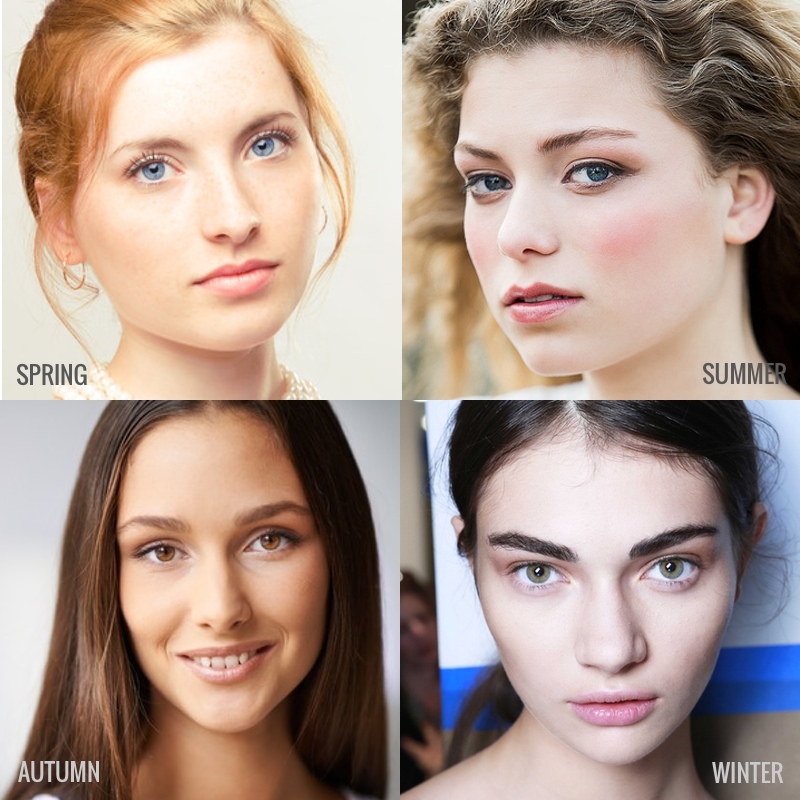 Join us in Color For Your Skin Tone series as we go even deeper into seasonal color analysis. We’ll be talking about each of the seasons individually and the 8 additional modifiers within the four seasons. This series will also include season specific color palettes and the four universal colors that everyone looks great in!